Rosacea is an increase of small enlarged veins (angioectasias). It is most common in the face (usually on the cheeks, nose and chin) and throat. Symptoms often increase (strongly) with changing temperatures which make the skin redden. The veins never disappear by themselves. Rosacea is common in people who often work outdoors. Extensive exposure to ultraviolet rays in sunlight is a risk factor for developing rosacea. There is also a genetic factor, which has to do with the strength or weakness of the veins’ walls. Many people see the effects of rosacea as cosmetically displeasing. Fortunately this is condition is effectively treatable nowadays. 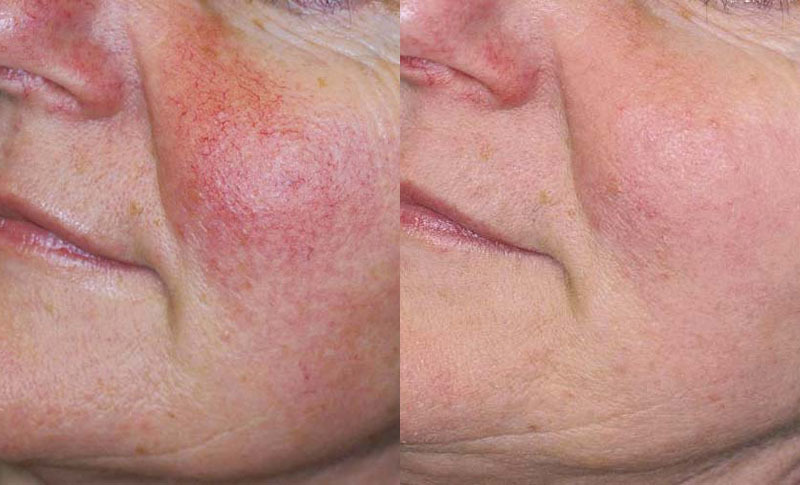 Using IPL many forms of rosacea can be treated safely and effectively. The unwanted enlarged veins are removed by the high energy pulsing light. This light is absorbed by the red blood cells in the veins and then conducted to the walls of the veins. Here light energy is converted into heat energy and the veins are hit by selective heat. The flash of light will cause thickening of the veins’ walls thereby narrowing or closing enlarged veins so that they are no longer visible or less visible in the skin. Initially the treated veins become darker in most cases, which makes it seem as if the rosacea has worsened. However, this is a good sign as it means the veins have been hit. Within a few days the body clears up the targeted veins and the darks colour will disappear. After on average 1 to 5 treatments (in necessary repeated every three weeks) you will see a visible result. The skin will also be firmer and in better condition. There are also several cosmetic products on the market designed to mask or slow down the red colours typical of rosacea. We work with Neoderma, Obagi and Maria Galland for rosacea skin and we have products specifically designed to give the best treatment for your skin. Before the treatment your face will be cleaned thoroughly to so that all superficial impurities and traces of make-up are removed. After that the sapphire is is applied to your skin without pressure and the flash will be applied. During the flash your eyes will be protected against the bright light. The flash will feel like a hot pinprick. After the treatment the skin will be cared for with sunblock. – In a free consult will discuss the IPL method and the possibilities for you skin with you personally. We will also ask you for additional information about use of medication and/or illness. – If you are using certain types of medication (such as antibiotics) during the treatment, it is important to let us know. – Don’t go into the sun three weeks before and after the treatment. Your skin will be light-sensitive and therefore it will need extra protection. During the treatment people you it is important to always use sunblock when you go outside, also preventively after the treatments.